"At Harebrained we're in an interesting position. We have a long history in the tabletop space—Jordan Weisman, our founder, did Shadowrun, Battle Tech, founded WizKids—but we also have a long history in the computer game space," says Ray Winninger, executive producer at Harebrained Schemes. Winninger's own background is just as complex, having designed multiple tabletop RPGs and worked on video games at Microsoft for a decade. With all that tabletop and video game talent floating around, it seems only natural for Harebrained to combine the two. Enter Golem Arcana—one part board game, one part video game. Ray Winninger and I played a demo match of Golem Arcana on a single tile, though the full game includes six of these tiles. 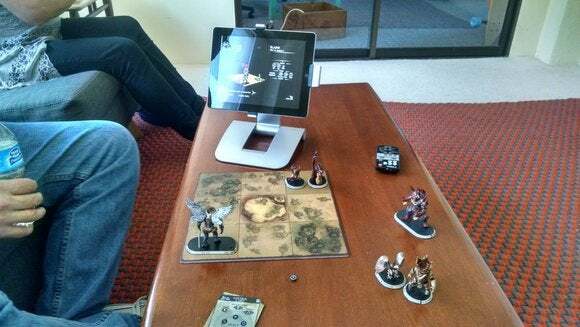 Note the tablet in the background—it runs the Golem Arcana companion app. 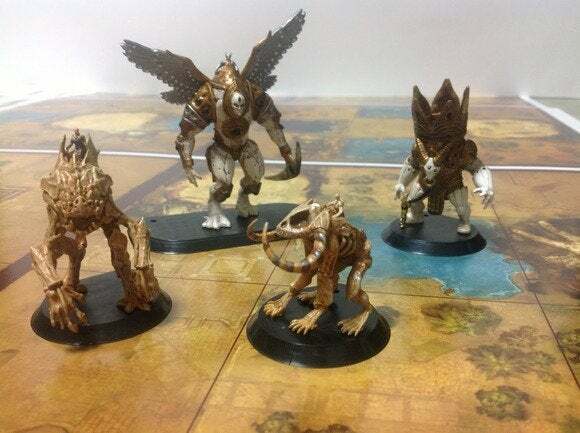 "One of the spaces we're interested in exploring at Harebrained, and Golem is the first effort, is how can we take those tabletop games that we know and love so much and leverage technology to enhance that experience in some way," says Winninger. 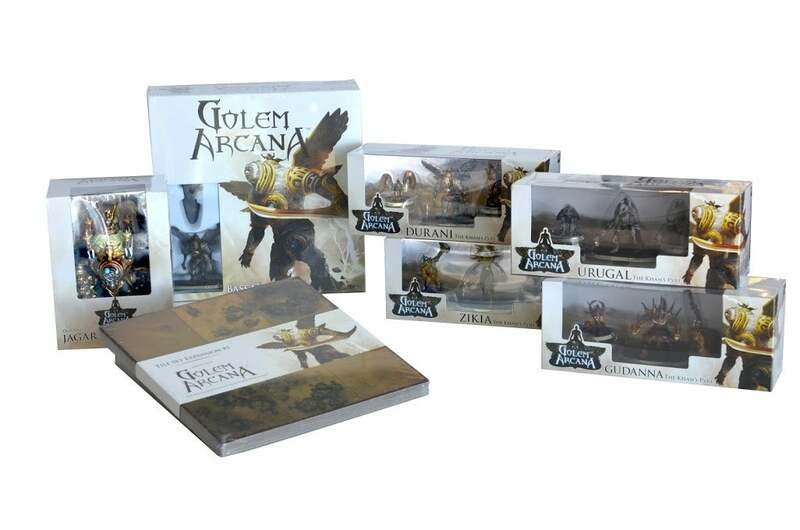 Let's be clear: Golem Arcana is more board game than video game. The basic game set—which will run you $80—comes with six tiles (double-sided, with different game environments on each side), six miniatures (the "Golems" in Golem Arcana), corresponding action cards for each of the Golems, and then the TDI or "Tabletop Digital Interface"—an oversized Bluetooth-enabled stylus. That last bit, the TDI, is key to Golem Arcana. "All the game pieces are interactive," says Winninger. "They're all overprinted with a fine mesh of magnetic dots. 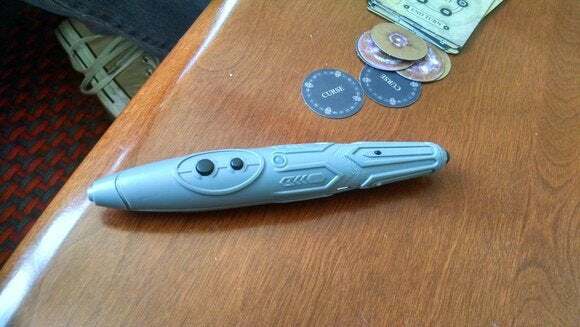 I can touch any of these game pieces—the cards, the board, whatever—with this Bluetooth device and interact." The TDI—"Tabletop-Digital Interface"—is a Bluetooth-enabled stylus. So you arrange your tiles, you lay out your figurines, you start the game—it's all very tabletop in nature. But where a pure tabletop game has you rolling dice, doing math, keeping track of both major and minor rules, Golem Arcana does all that for you through an iOS/Android/PC app. "You never read a rulebook," says Winninger. "The first time you play is a video game-like tutorial. It's going to walk you through everything. Say I'm curious, 'What's the cover bonus for being on a hill?' At any time I can touch this hill [with the stylus] and the app sums up whatever I need to know." Actions are just as intuitive. "I just touch the ability I want to activate," says Winninger. "I touch Walk on the card or on the base of the figure, and the app lights up and shows me all the possible legal spaces he can move to. Touch the guy, touch the space where I want to move, and the app does all the rest." 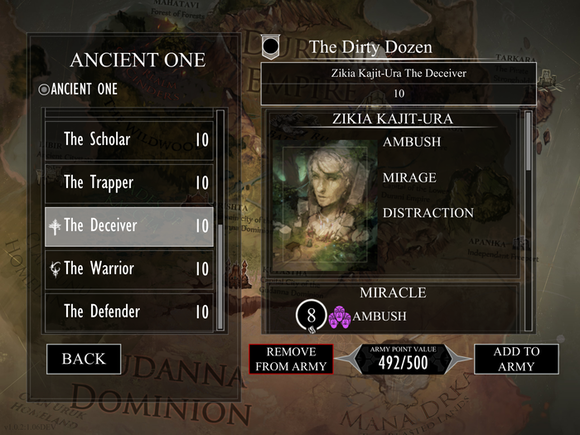 A look at the Golem Arcana app. Well, everything except moving your figurines in real life—you'll be pushing the miniatures around the board to keep the physical game in sync with the app. "One way to think of it is the app acts as a referee during the game," says Winninger. But that's just the start—making the game accessible to people who might be intimidated by the large-scale figurine warfare of a Warhammer 40K or the like. Introducing technology to board games also allows both players to enter a game blind. "Our scenario designers have a robust toolkit they can use to embed all sorts of secrets inside the scenario. Think of it like the tools a level designer has available," says Winninger. "What that means is when we sit down to play, there's all sorts of hidden surprises that neither player is aware of. The app is going to spool those out as we go." He goes on to describe a Golem Arcana match he played recently. Upon starting the game, the app notified both players that there was some sort of strange mist hanging above the battlefield. It didn't take long for them to find out why—it turned out the mist was flammable, and when one of the Golems used a fire weapon the entire battleground exploded. Every character on the board received damage (which is tracked by the app) and all of the Forest tiles "caught fire." They played a little further, and upon entering a certain space, the app revealed a shattered magical artifact. The player picked it up and instantly all the mist disappeared and the fires extinguished. "That's a simple example," says Winninger—but only because of the dual technological/tabletop nature of Golem Arcana. As a pure tabletop game, that Mist/Fire/Secret Artifact scenario is impossibly difficult. Either one of the players would need to know the mist was flammable ahead of time, instantly changing the course of the battle, or players would need to micromanage the rules on every turn to know when to look up the special "Mist Conditions." And there are more complicated plans. "For instance, you can encounter a non-player character [on the board]. You can have a conversation with a non-player character, like you might have in a CRPG, and the outcome of that conversation might affect the battle," says Winninger. With all these RPG-like mechanics, I ask if Harebrained is working on an actual tabletop RPG to take advantage of this technology—if Golem Arcana is but the first tiny, manageable step on the way to an RPG. He laughs and says, "That's the product I'm writing the early treatment of right now." 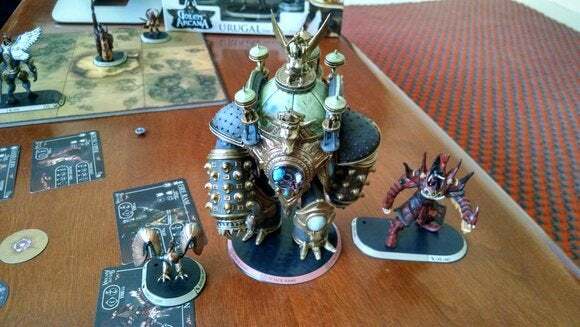 "This miniature space is simpler than an RPG, and not just from a 'getting the technology right' standpoint but from a production standpoint," he continues. "But now we have the technology down pretty well, and yes, we see the TDI [stylus] as the lynchpin of a whole potential line of products." "I personally am itching for the RPG," he adds. "I can't wait for that." But back to Golem Arcana—the app also allows for a lot of meta-scale elements that aren't possible in a traditional board game. Every time a match is played, the results are uploaded to Golem Arcana's servers. This allows Harebrained to run a persistent battle, with the results a direct reflection of all the thousands of Golem Arcana matches played. Certain matches may even change the tide of the meta-battle entirely, unlocking new scenarios globally or changing other conditions. "Any time we sit down and play, there's a chance our particular game is going to be one of the key battles in the war that changes the game for everyone," says Winninger. And since it's a tabletop game, it's meant to be played with people. Harebrained is building in tournament tools right into the app, allowing you to see any organized events within a fifty mile radius of you and thus (hopefully) driving players towards those events. "The software also allows us to run tournaments that are happening in multiple locations at one time," says Winninger. "Imagine if a game store in Jersey is playing against a game store in San Francisco, and all that's going through the server." Along those lines, within 30-60 days after launch, Harebrained plans to let you play with a friend asynchronously—you can each buy a Golem Arcana set and play from your separate houses across the app. Golem Arcana's biggest flaw? Price. $80 for the base game, plus $35 for each three-figure expansion pack. It'll cost you, though, and that's Golem Arcana's biggest flaw at the moment. While board game and miniature fans are used to spending a lot on games, Golem Arcana's got quite a price tag. $80 is less than I expected IT to cost when I saw how much you receive in the base game, but it's not exactly cheap—and each three-figure expansion will run you another $35. If you're going to get into Golem Arcana, you're going to get in deep. And that's before you get into the digital side of the game. In addition to your physical miniatures, each Golem is piloted by a small human figure, called a Knight. These Knights are digital characters, and while there are seventy in the base game, you can buy more for a dollar each. Same with the Ancient Ones—these gods give you special powers on the battlefield, and you can buy new ones for a dollar each. It adds up fast, and we haven't even discussed the Colossus-size Golems yet—massive figurines (I'd guess about eight inches tall) that take up an entire space on the board and come with three pilots. 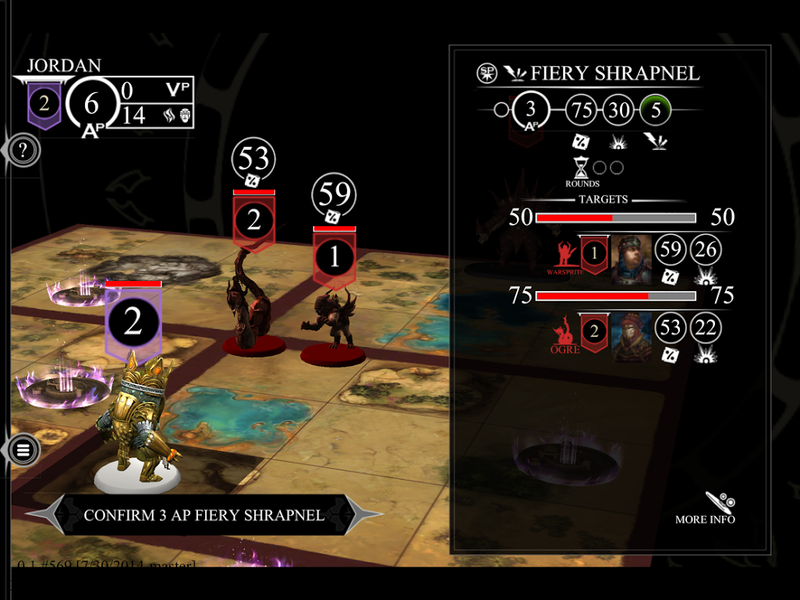 Golem Arcana is an ambitious experiment, though personally I'm looking forward to the eventual RPG integration more than this game's miniature battles. Still, I was able to jump into a match with Winninger and beat him, having never played before. the mechanics are all very RPG-esque, and the game should feel comfortable to both video-game and board game fanatics. It's not quite the holographic chess game Star Wars promised, but it's interesting to see what board games can learn from video games, and vice versa. We'll have a more in-depth review once I get a few matches under my belt and play around with some of the more involved scenarios. For those who are jumping straight in this week I can say the TDI worked well in the one round I played, and all the physical pieces felt high-quality. Golem Arcana releases Tuesday, August 13 for iOS/Android, with a PC update to follow.